In Texas, far-right religious groups and politicians, namely the far-right Christian organization Texas Values, continue their attack on progressive transgender rights legislation. These faith-based entities represent a fringe minority of Texans, but remain a powerful sect nonetheless, reaching to the heights of the state government and possibly skewing the perception of how Christians really feel about LGBTQ people and their freedoms. In late January, Representative Bill Zedler, a Republican from Arlington, filed House Bill 1035, known as the “Free to Believe Act,” a bill essentially enshrining the right to discriminate against LGBTQ people on the basis of religious belief. As Zedler peddles HB 1035, several other bills have been introduced that are its inverse, designed to prevent discrimination against trans people in labor, housing, employment, and public accommodation. The TVA argument that legislature supporting LGBTQ people infringes on Christian freedoms isn’t new. It is the basis behind many attempts led by evangelical groups to make the law reflect their beliefs—for example, that a doctor should be able to refuse life-saving medical care to a transgender person if their faith tells them to. TVA also published a comment from Ann Hettinger, a former director of the 40-year-old extremist Christian organization Concerned Women for America (CWA): "Any inclusion of men in women’s private spaces is a gross violation of their privacy and safety." The CWA has been called a “longtime anti-feminist, anti-choice, and anti-LGBTQ group” by the Southern Poverty Law Center, a legal organization that tracks hate groups in the United States. CWA’s mission, according to their website, is to “bring Biblical principles into all levels of public policy." The plot to eliminate LGBTQ rights is a coordinated effort between these religious groups and politicians who share their extremist ideologies. Zedler, who proposed the “Free to Believe Act,” was endorsed by TVA in his successful 2016 run for a Texas State House of Representatives seat. In 2016, Ken Paxton, Attorney General of Texas, filed a federal multi-state lawsuit to block the Obama administration’s guidelines protecting transgender students’ right to use the restroom corresponding to their gender identity. 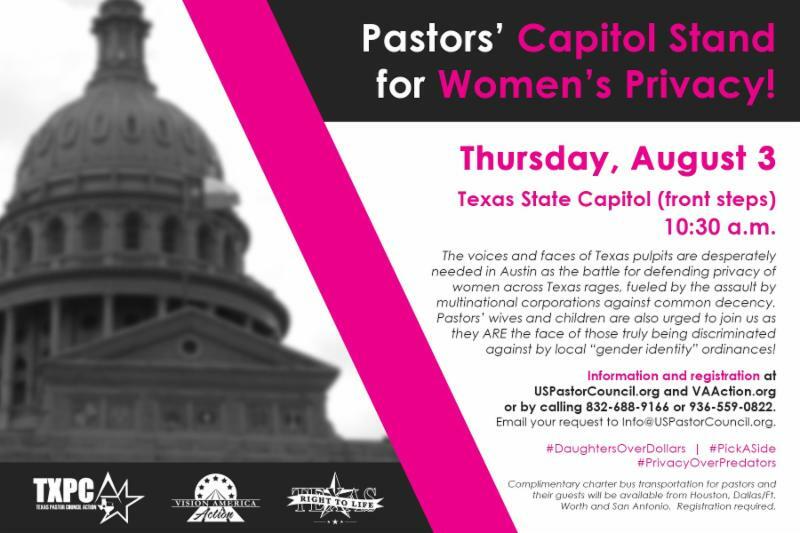 In 2017, a rally was held outside the Texas state capitol, in part by the US Pastor Council (USPC), in support of legislation that would make it illegal for trans people to use bathrooms outside of the gender they were assigned at birth and to participate in sports that align with their gender identity. The USPC has reported ties to Ken Paxton’s office, and Paxton is also closely linked with the First Liberty Institute, an organization that, according to the SPLC, “paints Christians as ‘victims’ of oppression and works to implement anti-LGBTQ policies and push lawsuits that could codify discrimination against LGBT people under the guise of so-called ‘religious liberty.’” In late 2018, U.S. District Judge Reed O’Connor ruled in favor of a Texas lawsuit alleging that an Obama administration–era anti-discrimination rule could force doctors to work against their religious beliefs. In 2019, the USPC has taken a stand against the transgender rights laws proposed in Texas, furthering a fringe agenda to dismantle equality for LGBTQ Americans. Though there are powerful anti-LGBTQ religious organizations and politicians working against equality in Texas, the views they hold may represent a minority among evangelicals. On January 31, the Public Religion Research Institute released findings from a survey of 3,000 Texans which indicated that a majority of white evangelicals support laws protecting LGBTQ Texans. According to a press release sent to Broadly, “64 percent of all Texans oppose discrimination against LGBTQ Texans, including majority support from white evangelical Protestants, 54 percent of whom oppose discrimination.” This data suggests that Texas anti-LGBTQ evangelical groups and their political representatives are fringe extremists that neither represent the American public nor the majority of other Christians. Dan Quinn is the research director for the Texas Freedom Network, a nonpartisan organization advocating for religious freedom and individual liberty. According to the TFN website, they are a watchdog on the far-right religious sect, and have been “instrumental” in blocking extremist measures from becoming law. In an interview with Broadly, Quinn said that “Groups like [Texas Values and CWA] are way out of step with the majority of Texans today on the issue of nondiscrimination…. Most Texans today think it’s wrong for businesses to fire people or refuse to serve them simply because of who they are or who they love. So opponents of these bills have decided their best strategy is to make hair-on-fire claims about bathrooms and Bibles to scare folks into supporting discrimination. Outside of the extremists in groups like TVA and CWA, more Texas Christians are speaking out about how the battle over transgender rights is informed by their faith.